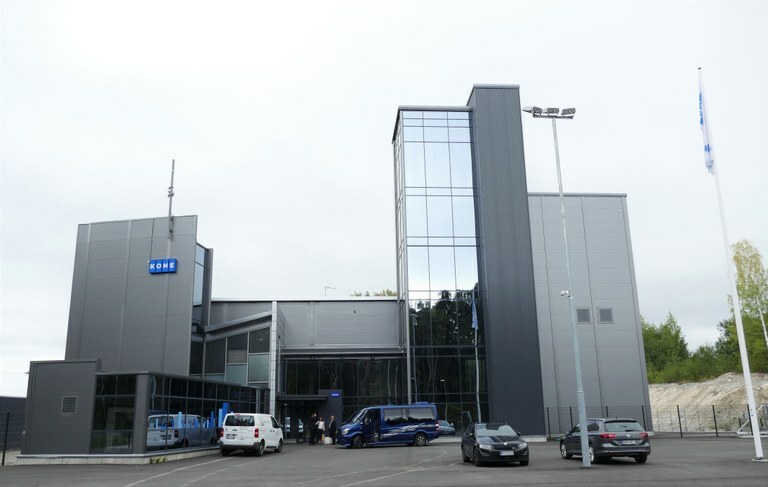 Few Nordic companies play such a big part in the work environment as Kone. But they do it discretely. As long as everything works, hardly anyone thinks about the lifts and escalators we use to and from our jobs and inside the building where we work. Now Kone want to play an even bigger role – by using their knowledge about the flow of people to improve the workplaces. “Take a ten year-old office building. 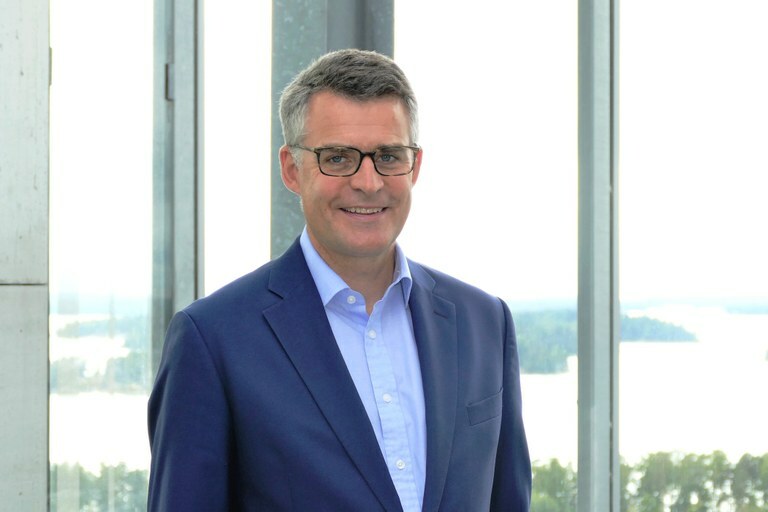 Today you probably have 30 to 40% more people working there than what the building was originally constructed for,” says Henrik Ehrnrooth, President and CEO at the Finnish company, which is one of the four largest lift manufacturers in the world. We are on the 16th floor at Kone’s headquarters in Espoo. One of the four lifts running up one of the building’s sides has silently brought us here. All the walls in the lift are glass. At the top you can see as far as Helsinki, around 20km east. But there are few other tall buildings around – at least no skyscrapers. Henrik Ehrnrooth quickly adds that out of 5.5 million lifts in Europe, most are installed in blocks of flat five to six stories high. “Asia is about to overtake Europe when it comes to the number of lifts, while in North America there are only one million lifts. Spain has more lifts than the USA, where it is common to live in detached houses. If a lift stops working in a block of flats it is merely irritating, unless you are so old or handicapped that you cannot use the stairs,” says Ehrnrooth. “In an office building it is like closing one lane on the motorway. You quickly get long queues. That’s why we do everything we can to maintain the lifts regularly so that they don’t stop,” he says. Around one year ago, Kone announced a new cooperation with IBM allowing them to collect information from lifts 24/7. By analysing the information from hundreds of thousands of lifts, the company can identify warning signs of problems that need to be addressed. This means an engineer can be sent out before the problem actually arises, and he or she can also carry the correct spare needed for that exact lift. This means the number of faults and stops can be dramatically reduced in the future. This is enormous amounts of data – or Big Data, as it is known – which also provides information about the flow of people inside a building. “Spain has more lifts than all of the USA,” says Henrik Ehrnrooth. “Improving the flow is not only about increasing speed or lift capacity. It can also be about organising the company in a different way. One good example is a cruise line company for whom we analysed how people moved around one of their ships. We discovered than 60% of the passengers used the lifts in the aft of the vessel, while only 40% used lifts near the bow. Another way of influencing the flow in an office building is for staff to link their mobile phones to the lifts. When an employee approaches the building, the computer system controlling the lifts already knows which floor the person normally wants to go to. Different employees are grouped together and get a message on their mobiles which lift to get. “This works well in many buildings, like at our own headquarters where we used to have 250 people working but now have 400. Yet influencing the flow of people is about more than simply using the lifts better. 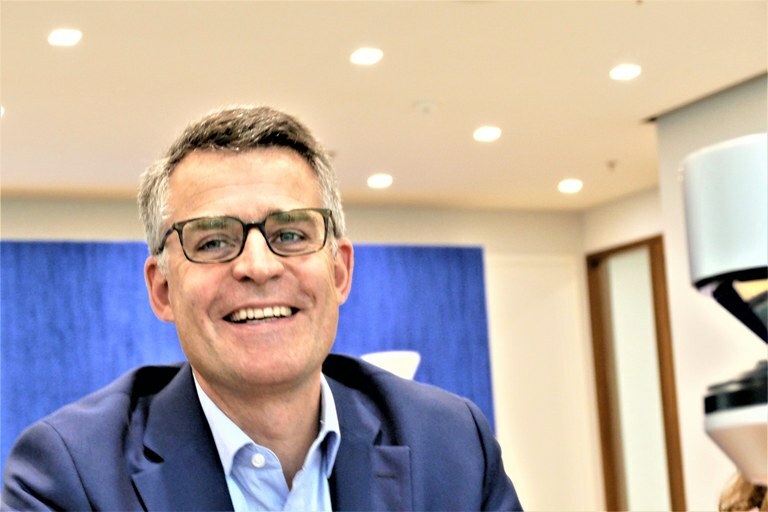 You can also improve work environments and improve cooperation, for instance by making sure people meet a bit more spontaneously,” says Henrik Ehrnrooth. Office layouts have varied, from cell offices where most people had their own rooms, to open space offices. An increasingly popular model is the so-called activity-based office. The idea is to divide the office into separate zones, shaped to fit different types of work. The most common types are concentrated work, creative work and teamwork. There are no personal workstations. Everyone chooses the environment and workstation which suits the situation the best. There are no rules for how many square metres each employee should have. According to property companies like Swedish Vasakronan, there used to be a rule of thumb that said each person needs 20 square meters, inducing all areas like toilets, kitchens, storerooms and entrées. Activity-based offices can reduce the space to 12-15 square metres per person, thanks to open solutions and improved ventilation. Technology is the driving force behind the new office model. Landline telephones and desktop computers have been replaced by smartphones, laptops and cloud computing. Employees are given more responsibility for making sure they always carry the equipment they need with them. Kone too has made use of the new business opportunities that arise up when transport solutions can be integrated with the mobile telephone. It can for instance replace the key to your flat. “We performed a survey which showed that 51% of Swedes believe their lives would be simpler if they could use a smartphone as a key to their home. It is mainly younger people between 18 and 35 who see the advantage of being able to let visitors in to their house, even when they themselves are not at home. This would for instance make it possible to accept deliveries while you are at work,” says Malin-Brandt Lundin, Kone’s Scandinavian head of marketing and communication. Kone’s test site in Tytyri is next to a mine which has a shaft running 350 metres below ground. This is where new lifts are tested before installation, both with free falling and braking, and testing of wear and tear. There are many ways of easing everyday life’s often opposing demands from home and work. “The mobile telephone can become a kind of ‘digital gatekeeper’. It is the final stretch – up to the front door – which is the main challenge for companies that carry out home deliveries. 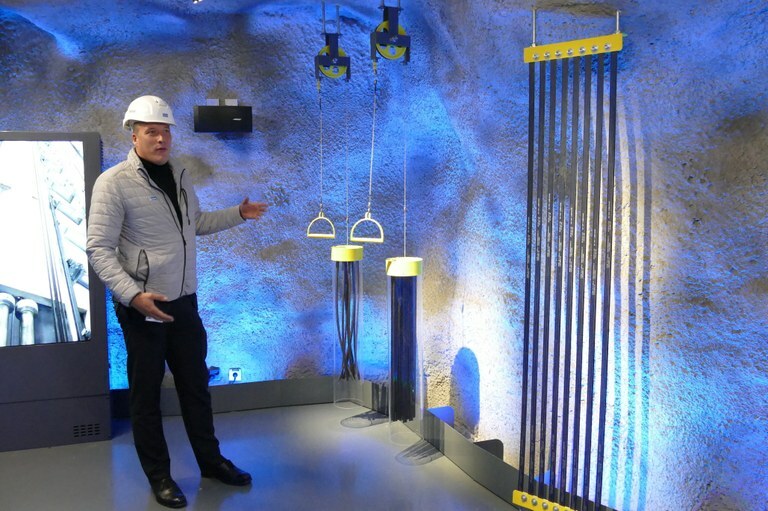 The problem is all the goods that cannot be delivered because the customer is not at home – or that you end up waiting for a delivery that never arrives,” says head of technology Santeri Suoranta when we meet him at Kone’s Tytyri test site, which is next to a mine one hour north from Espoo. This is where new lifts are tested in a 350 meters deep shaft. It is the world’s only free fall lift test site. The lift is filled with sandbags weighing one tonne, and are allowed to fall for a while before the brakes are applied. “Safety is the most important thing of all. All systems are made to withstand 12 times more than what it needed,” says Santeri Suoranta. Santeri Suoranta demonstrates the difference in weight between a steel wire and the new lift lines used by Kone. They are called Ultrarope and are made from carbon fibre. The weight of lines is what limits how many stories a lift can operate between. “Of course we also take the issue of personal integrity and cyber safety connected to our new technology extremely seriously,” he underlines. A technician at Kone's test facility in Tytyri is performing controls on a lift (above). Kone was founded in 1910. The word is Finnish for “machine”. The company employs 55,000 people and has installed 1.2 million lifts and escalators in 60 countries. Its 2017 turnover was 8.9 billion euro. Half of that came from selling new equipment, while maintenance and modernisation of older lifts made up the other half.